Should The CEO Lead or Follow the Board in Development? The CEO’s next responsibility is to work closely with board directors who have development backgrounds, skills, contacts and the interest to expand the efforts to attract resources from a wider range of organizations and individuals. This is usually a small group. 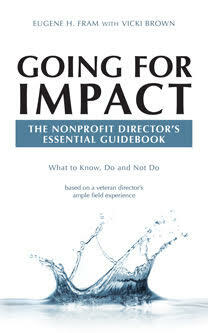 Although some directors may be affluent and may make substantial contributions to the organization themselves, they may hesitate to become involved in the organization’s development effort. A nonprofit group identified a community need that fell within its mission and designed a program that would assist the specific population in need. The program was taken to the board, which agreed to move ahead with it, after substantial discussion. Several board directors were requested to assist the CEO in opening doors or in making calls. Some board members volunteered to make their own calls, but in other situations, the CEO and a director made joint calls. The board chair and CEO need to clearly know those director who have the interest and drive to become involved in development. Those who lack these qualities can resign their board positions if they are pushed in the development direction. However, all directors need to be in a comfort zone to bring potential leads to the CEO. When it comes to raising funds, consider the CEO the forward scout looking for potential sources of funds. The board – the cavalry – is called to support that effort and broaden the base of support. In other words, the scout give the signal, but the cavalry is needed to take the objective. ← Two Nonprofits Merge: Synergy or Collision Course?